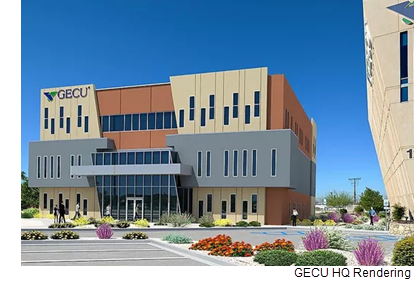 EL PASO – GECU, the city’s largest locally owned financial institution, plans to build a three-story, 40,000-sf building next to its decade-old headquarters at 1225 Airway Blvd. in East Central El Paso. The current building resembles a diamond with its uneven, sharp edges. It's known as the "diamond in the desert" and the second building will be a "new gem," GECU officials said. Construction is expected to begin late August or early September 2018 and open in 2020. The new building will be smaller and more subdued than the credit union's 88,000-sf, four-floor headquarters building, which opened in 2008 and is called the GECU Operations Center. The current HQ, where 350 employees work, is full, and GECU needs more office space to support future growth.